Improper height and angle of the keyboard, mouse, or working surface can cause employees to bend their wrists or lift their arms for extended periods. The work surface may need to be raised or lowered to keep the operator's arms in a comfortable position. This can be achieved by installing an adjustable keyboard extender or tray (Fig. 1), by providing an adjustable table/working surface, or by raising the chair and providing a footrest if needed. 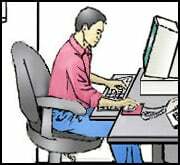 Adjust the keyboard and/or chair height so the employee's elbows can hang comfortably at the side of the body, the shoulders are relaxed and the wrist is not bent up or down or to either side during keyboard use (Fig. 1). The angle of the keyboard should also be considered when determining the preferred height. The preferred working position for most keyboard operators is with the forearms parallel to the floor and elbows at the sides; this allows the hands to move easily over the keyboard. A keyboard or mouse that is not directly in front of or close to the body (Fig. 2) forces the employee to repeatedly reach during use. Mouse placed too far from the body. Mouse placed close to the body. Make sure the keyboard is placed directly in front of the user. The mouse should be positioned at the operator's side with his or her arm close to the body (Fig. 3). A straight line should be maintained between the hand and the forearm. The upper arm should not be elevated or extended while using the mouse. The employee should not have to reach to use the mouse. 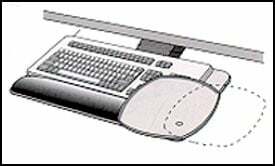 Consider using a mouse platform that rotates above the keyboard while maintaining about the same plane. This design (Fig. 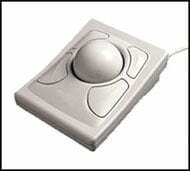 4) allows the mouse to be used above the 10-key pad, which gives the user a better wrist angle and reduces reach. Bending wrists sideways (Fig. 1) or up and down (Fig. 2) while keying. Hazardous side bending of the wrist. Reduce bending of the wrists by moving the entire arm. Do not use the feet provided on the back of most keyboards if this causes wrists to bend upward (Fig. 2). 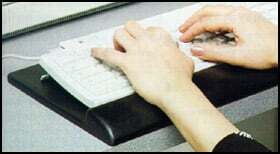 If the operator sits lower in relation to the keyboard, the keyboard feet may be used to maintain a neutral wrist (Fig. 3). Wrists should be extended straight, not bent up or down. A mouse pad or wrist rest can be used to help maintain straight wrists. Wrist/palm rests (Fig. 3) should not be used while keying, but to rest the wrists between periods of keying. Straight wrists with a rest. Consider using alternative pointing devices such as trackballs (Fig. 4), or touch pads. Alternative keyboards (Fig. 5,6) may also be helpful in allowing the worker to maintain a neutral wrist position.